As far as I can determine, Theodore A. 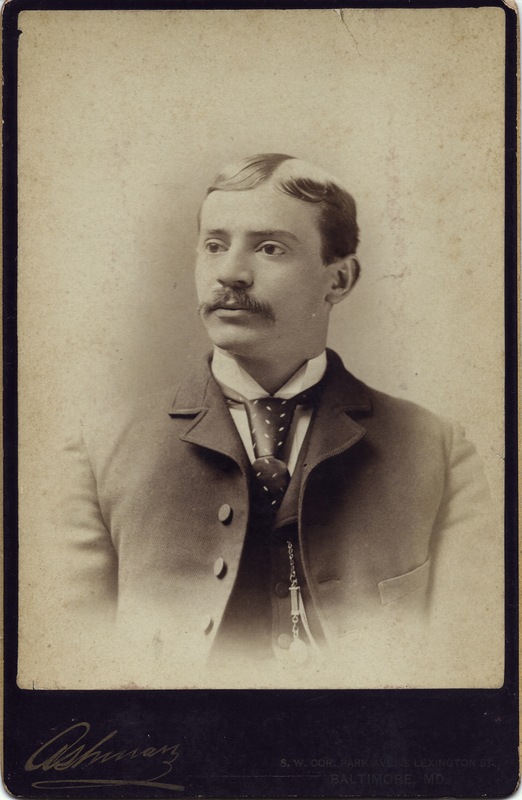 Cross, another 1888 graduate of the University of Maryland Dental Department, lived a quiet bachelor life as a Piedmont, West Virginia dentist. He was born 9 Mar 1862 in Westernport, Md. to William R. Cross (1831-1895), who became head of the carpentry department for the B & O Railroad operations in Piedmont, and milliner Penelope (Jameson) Cross (1838-1891). Piedmont was a key B & O Railroad hub, and in its heyday was a prosperous town. The Cross family’s upper middle class status probably enabled Theodore to study for a profession in Baltimore. Dr. Cross died on 4 Mar 1944, Burlington, Mineral, West Virginia.He and his parents are buried in Philos Cemetery, Westernport, Allegany Co., Md. He was a member of the Knights of Pythias, Piedmont Company No. 10, Uniform Rank, which held graveside services for him at his death. Cross had his cabinet card portrait taken at the studio of William Ashman (1863-1902). Ashman learned photography from his uncle, stereoview photographer and publisher William M. Chase. The young photographer worked for David Bachrach, then in 1877 left to open his own studio. As with many of the portraits of dentists I’ve written about, Cross’ photograph focuses on the bust and employs vignetting–careful overexposure of the background–to create a floating effect. The popularity of vignetting may point to a shift away from the gimmicky props and backdrops of earlier years. The technique has, however, the unfortunate side-effect of destroying depth and flattening the sitter’s image. Compare this lack of depth with the much more attractive and dimensional effect created when a nuanced, textural backdrop returned to the studio in the 1890s, as in this moody later Ashman portrait.